Green home remodeling is good for the environment, and it's great for you. Along with helping keep your carbon footprint to a minimum, a green, energy-efficient home will be much more comfortable. And along with that, you'll be saving hundreds of dollars each year! Silver River Basement Systems is a certified installer of the Total Basement Finishing basement remodeling system-- green products that will last you a lifetime. 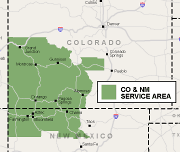 We offer free quotes throughout the Colorado & New Mexico area, including Espanola, Canon City, Aztec, Montrose and many areas nearby. Call or e-mail us today to get started! With landfills filling up with drywall and more shallow gypsum mines eliminating swaths of wildlife, we know that drywall is far from a green remodeling material. In landfills, drywall adds toxic sulfate to the water and emits a rotten egg smell. In your basement, damp drywall will also support mold growth as it rots in the humid environment, contributing to home allergens. Specialized materials such as fiberglass insulation, according to Denver AIA committee on the environment, are not readily recyclable, nor are they in high enough demand to be cost-effective when produced widely. And while fiberglass is inorganic, the dyes, paper backings, and resin used in their design can easily grow mold when subjected to basement humidity. It's becoming increasingly clear that there has to be better products for basement remodeling-- and those products are the Total Basement Finishing System. Gypsum used for drywall is taken from shallow, open-pit mines. It creates 25% of the debris in construction. 17% of drywall is wasted during installation, and none of it is cost-effective to recycle. Silver River Basement Systems would like to provide you with a Free Estimate and 90-page full-color book, "Basement Finishing Science", to help you design a long-lasting, healthy, and beautiful new space in your home. A copy of this book is available with every free basement quote they provide. To get started with a free, no obligation basement remodeling estimate, call us or send them an e-mail today! Silver River Basement Systems proudly serves Colorado & New Mexico, including Grand Junction, Durango, Farmington NM and nearby.